With the online humidity calculator from E+E Elektronik, humidity-related parameters can be calculated quickly and easily. In contrast to other programs, it takes into account measurement uncertainties. The E+E humidity calculator is now also available as a free app for mobile devices. The app for Android or iOS operating systems can be downloaded from the Google Play or Apple App Store. The app also features a pressure dew point calculator. Based on known ambient conditions, the E+E humidity calculator converts among all humidity-related parameters, such as relative humidity, dew point / frost point temperature, water vapour density, mixing ratio, partial water vapour pressure and specific enthalpy. Calculations can be made in metric (SI) as well as imperial (US) units. Unique is that the E+E humidity calculator takes into account measurement uncertainties in the calculation. This means that realistic and reliable total uncertainties can be calculated based on the accuracy specification of the measuring device. The app also features a pressure dew point calculator specifically tailored for compressed air applications. Thanks to the intuitive operation the humidity calculator is very easy to use. The conversions and calculations can be saved or sent as a PDF. The online humidity calculator (www.humidity-calculator-online.com) also offers the option of copying the results to an Excel file. 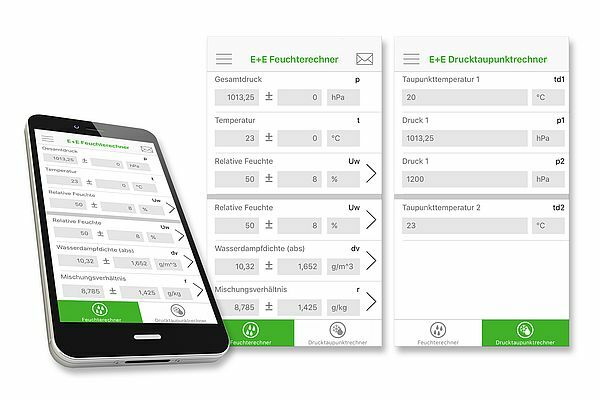 The online version of the E+E Humidity Calculator is available in 8 languages, while the app is available in German and English.